This is a 32 ounce bottle of ProTek R/C "TruGuard" RC Car Mud Guard. ProTek R/C understands that how your ride looks is as important as how well it performs. We all want to shine, but a clean car is not all about showing off; dirt and grime can slow a car down, kill bearings and lower overall performance. Sometimes running at your peak can just be a wash away. The ProTek R/C TruGuard Mud Guard is a polymer based product that provides a protective barrier and a shielding agent to help prevent water, mud, dirt and general grime from sticking to your machine. This barrier makes cleaning much easier and provides lasting effects. This saves you time and energy to allow for quicker wash-ups and cleaner results. Just spray TruGuard on your clean dry machine and then wipe off with a damp rag. No brushing or scrubbing required! TruGuard Mud Guard provides a lasting shine that is resistant to multiple washings. 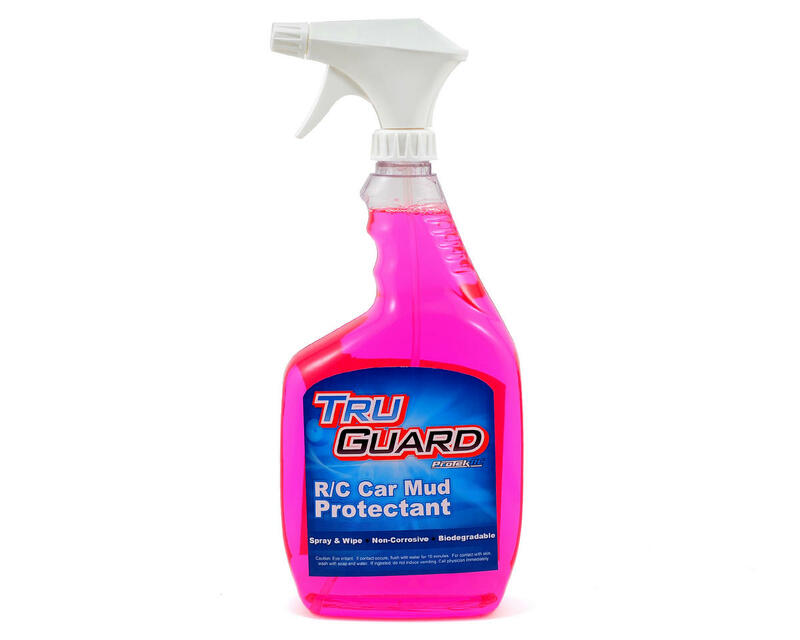 TruGuard does not contain any solvents and is non-corrosive, non-toxic and biodegradable. Apply to vehicle after thorough cleaning. Surfaces do not have to be dry before application. Simply spray Mud Guard directly onto vehicle surface, or onto clean cloth, and wipe to even film. Do not wipe dry, allow to air dry for best application. TruGuard can be re-applied after every wash for more protection and easier cleaning. I used this and the other Protek TruClean products on my dirt bikes last weekend. They came out looking great, the dirt came right off and the plastics looked new. I had to get my father in law a few bottles after he saw the way they cleaned up.